Book collectors seeking award-winning books often say they want "a first edition in a first state dustjacket -- with no award sticker on the jacket!" Everyone has their own collecting preferences and it's perfectly understandable that some people like their dustjacket illustrations unblemished by any type of sticker. However, the presence of a sticker does not automatically indicate that a book is wearing a second-state jacket. Many true first-state jackets DO have Newbery or Caldecott stickers attached. This occurred because first edition volumes were still in the warehouse when the awards were announced, so the publisher simply affixed stickers to these books before sending them out for sale. Therefore, seeing a foil sticker on a Newbery or Caldecott book does not necessarily mean it's a later printing. Nevertheless, it's still a good idea to check for other signs that the jacket may be a later state because someone innocently or intentionally "married" to a first edition volume. Is the price on the front flap the same price as the original book? Is there any printed mention of the Newbery or Caldecott on the covers or flaps? Are there quotes or reviews on the back panel that are not there on other copies of the book? One thing I can say for sure: if you see a silver Newbery or Caldecott Honor Sticker on any book prior to 1972, it's definitely a later-state dustjacket. I believe 1972 was the year that what were previously known as Newbery and Caldecott "runners-up" became known as "Honor Books." And that was when the silver Honor Book seals began to appear on these books. I must admit that I've never been one of those purists who insists that no foil stickers appear on my books. I actually enjoy looking at them, and observing how they've changed over the years. The illustration at the top of the page shows the Newbery sticker on my first edition of the ADAM OF THE ROAD by Elizabeth Janet Gray. If you look closely, you'll notice that Gray's name and the date are etched on the foil sticker. This is no longer included on Newbery stickers. 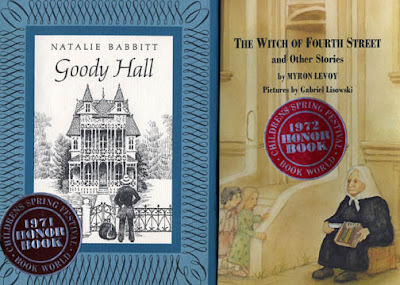 Among other oddities, I have also seen some older Caldecott books in which both the front and back of the medal were shown by affixing two overlapping stickers on the dustjacket of the book. I have never seen this done with a Newbery title. In earlier years, the style of the Tribune stickers changed from spring to spring, featuring frogs, clowns, and other whimsical elements, as depicted below. The final example, THE LITTLE FISHES, shows a rare Boston Globe-Horn Book sticker, which was used in the early years of that award. Although many collectors like their dustjackets untouched, I consider these award stickers to also be a part of the history of children's books and I'm glad I'm able to preserve them in my collection. Hey Peter--I'd like to bring those BGHB stickers back. Thanks for reminding me we used to have them!